Falls of Clyde is the only surviving iron-hulled four-masted full rigged ship and the only surviving sail-driven oil tanker in the world. 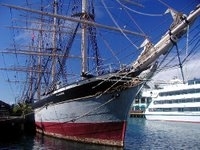 She is currently berthed at Honolulu Harbor. The Friends of Falls of Clyde (FoFOC) received ownership of the Falls of Clyde from the Bishop Museum on September 30, 2008. See the Ship's Log for regular updates!